Autism 360 Program Review – is it Too Good to be True? Can Polycystic Ovary Symptoms in Women be a Worrying Factor? Does Eating Fish During Pregnancy Trigger Autism? Are EEG Signals Likely to Predict Autism? Do Metabolites Help In Predicting Autism? How will the Blue Badge Scheme help Individuals with Hidden Disabilities? Can Early Schooling Lead to Erroneous ADHD Diagnosis? Procreation in life is not a problem-free adventure. In the course of humans giving birth to offspring, things can go wrong. Most times, children with some disorders are born, therefore creating what might seem like a burden to their parents or caregivers. Children with special needs may have been born with a syndrome, terminal illness, profound cognitive impairment, or serious psychiatric problems. Other children may have special needs that involve struggling with learning disabilities, food allergies, developmental delays, or panic attacks. Among the challenges facing many parents is support and care of their young children who are either born with special needs or develop such needs early in life. Parents often recognize that their child’s ‘unique’ characteristics may demand special skills in addition to the general knowledge, attitudes, and practices needed to survive in society. They, therefore, seek some programs that will equip them in carrying out proper caregiving to their kids with special needs. But in seeking these programs, some factors are considered which some of them are discussed below. First, the type of need required. Children are born differently so as their needs differ. The nature of a therapy a parent should consider is dependent on the child’s needs. For in instance, a child who has a respiratory disease like asthma would require a therapy that should be continuous and always available, since an asthma attack can come up at any time, and might be frequent based on the severity. Or a child with a learning disability will require coaching always in other to catch up with his or her studies. The second important factor is how long the therapy is required. Some needs for a child might not be a life term one. It might be for a specific period of time. Some disorders begin to manifest at an early period of life and spontaneously relapses later in life. An example is some general absence type of seizure that spontaneously disappears after puberty. So considering this particular factor will help the parents know how long they are expecting to provide the need or support for a child. More so, the child which the need is sought for is a very important factor to be considered. In as much as it might be quite obvious that the child needs support or help, the parents have to ensure that the child is receptive of it and that the therapy is in a way he/she wants it. This will help both the giver and the receiver sides. Finally, the society and the available options is a very important factor to be considered too. Parents might be so eager or dedicated to caring for their child that requires special attention, but unfortunately, society might be a limiting factor. Either they don’t have the therapy of choice or it might turn out they don’t approve of its use as seen especially in rural or under developing regions. Such limiting factors could be greatly reduced by affordable, modern online counselling services such as BetterHelp. So the parents have to put this factor in consideration to enable them rule out the therapy that they might not be able to procure or afford and go for the best available options on time special needs, for early intervention is an important step towards helping the child fulfill his or her full academic, emotional and social potentials. Maisha M. Syeda is a senior Ph.D. student (Ph.D. candidate) in the School and Applied Child Psychology program at the University of Calgary. She obtained her Master’s (MSc.) in the same discipline and completed her undergraduate studies in psychology and human biology from the University of Toronto. Maisha is the recipient of several provincial and national research scholarships, including the prestigious SSHRC (Social Sciences and Humanities Research Council of Canada) Doctoral Fellowship. She is currently completing a year-long doctoral, clinical residency in Washington, District of Columbia providing mental health services within the public-school system, specifically for the vulnerable child, youth, and family demographics. Maisha has extensive training and experience in conducting comprehensive psychological assessments, interventions, and treatment planning for autism spectrum disorder (ASD) and attention-deficit/hyperactivity disorder (AD/HD). Along with psychological assessment training and experience, she has experience in doing individual and group therapy and social skills training with children and youth with ASD and AD/HD and providing school-based consultations for classroom programming, behavioral management, and socio-emotional development. Does Autism Have An Impact On Memory? Never miss a story on Autism or ADHD. Someone you know has Autism? 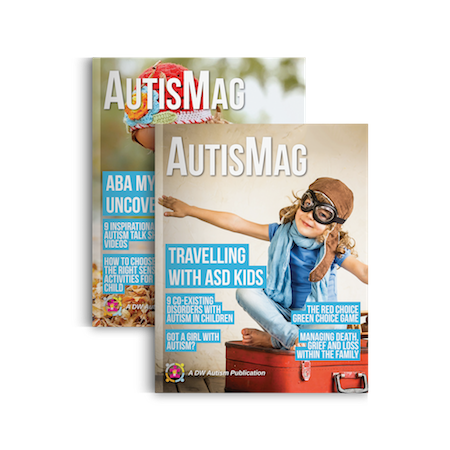 The #1 Autism Parenting Magazine trusted by more than 22,000 Parents and Educators across 133 countries! Get your FREE Issue Now! Get the EXACT Tools & Strategies that has helped THOUSANDS of kids like Josh overcome challenges with Autism Spectrum. ACCESS FREE, NO STRINGS ATTACHED! Josh is a 7 year old with Non Verbal Autism. He now goes to a regular school in Brooklyn and has 2 good friends . I am Ash Bernard, an Autism Coach and the Founder of AutisMag. I have just sent you an email with the course content along with a download link to your first resource. Make sure you check your Spam folder as well.